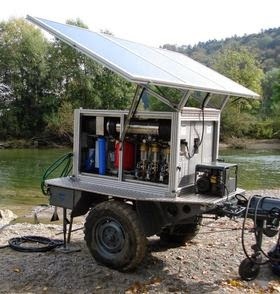 The Trunz Water Trailer is equipped with a solar powered TWS 200 water treatment system or a TSS 200/TBS 200 desalination system. It is complete and ready to deploy. It provides approx. 250 - 900 l of clean drinking water per hour from any water source. Powered by solar and/or wind energy it can run up to 24 hours a day, without ongoing fuel and fuel transportation costs. The system is complete with trailer, feed pump, automatic back flushing filtration, batteries, solar panels and controls. An Ultrafiltration membrane removes all virus and bacteria without requiring toxic chemical treatment. Alternatively we supply an Reverse Osmosis-System for brackish or saltwater. The Trunz Water Trailer is specially designed to work under harsh conditions and is ideal for disaster relief, military camps and supply during temporary drinking water shortage. The system is very compact, easy to install and to maintain.